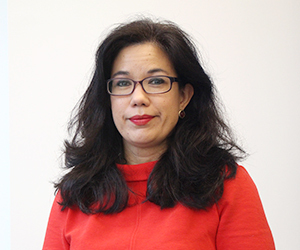 Dr. Len-Ríos’ research focuses on inequalities in public relations and health communication. Together with colleagues and doctoral students, she has earned more than 9 Top Paper awards in national and international academic conferences across multiple areas – public relations, health and science communication, mass communication & society, popular culture and magazine research. Len-Ríos has collaborated on interdisciplinary grant work, including a Washington University/Missouri School of Journalism NIH Center for Excellence in Cancer Communication Research. She has also been lead PI on the LASER project through the MU Mizzou Advantage program. She is an affiliate of the MU Center for Children and Families Across Cultures as part of the LASER collaborative, which is dedicated to studying the well-being of U.S. Latino adolescents. In addition, she serves as an inaugural board member of The Herschel S. Horowitz Center for Health Literacy in the School of Public Health at the University of Maryland (2014-2016). Dr. Len-Ríos is a member of the editorial boards of the Journal of Public Relations Research, Public Relations Review, the International Journal of Strategic Communication, Communication Yearbook, and The Howard Journal of Communications. She serves as a member of the Publications Committee for the Association for Education in Journalism & Mass Communication (2013-2016), which oversees the flagship journals of the association. She is a former head of the Communication Theory & Methodology Division of the AEJMC (2007-2008). She is also a member of the International Communication Association and the Society for Research on Adolescence. Dr. Len-Ríos has taught courses in cross-cultural journalism, public relations, public relations writing, strategic campaigns, master’s thesis seminar, quantitative methods, mass media seminar and doctoral seminar courses. Before coming to UGA, Dr. Len-Ríos served 10 years as a faculty member at the Missouri School of Journalism on the strategic communication faculty, 2 years at the William Allen White School of Journalism and Mass Communications at the University of Kansas, and 2 years at Georgia Southern University. Her students have won first place in the Arthur W. Page Society Case Study Competition in Corporate Communication.